I like brown long grain rice. I think about fixing it about an hour after I needed to fix it…. which does me no good and is even worse news for my family. I forget to get it made… and I must then substitute something else, which is generally NOT going to be as nutritious if it’s rice in the microwave! Finally get a rice cooker! Yes, I know - excited about home appliances! I did it!! 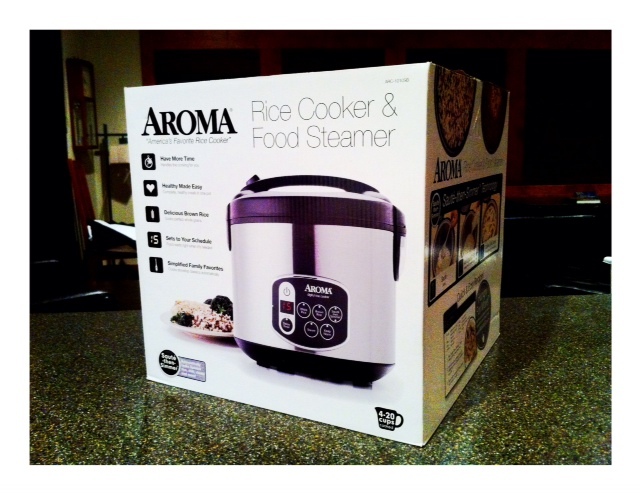 I’m excited to be the owner of a rice cooker/vegetable steamer! Just think, for about 1/2 of a cup of rice – and around 100 calories, you can get about 30 grams of carbs, and about 5 grams of protein!! Not to mention packed with vitamins, minerals and a low glycemic index for you health! YUM! Perfect to go with my steamed veggies! Didn’t God do a great job of giving us so many whole foods to enjoy? AND if you get a rice cooker…. you don’t have to sit it on the stove and babysit it for an hour or more! Posted on April 13, 2012, in Change, Diet, Food To Try, Label Reading and tagged Brown Long Rice, healthy eating, healthy for God, losing weight, portion control, reasons to be healthy, Rice Cooker, Rice Vegetable Steamer, worship in body. Bookmark the permalink. Leave a comment.